Oh yeah, this is what Nicolas Winding Refn has been doing. The stylish filmmaker behind Drive, Only God Forgives, and The Neon Demon has been busy with his Amazon event series Too Old to Die Young. It's been a while since we've seen anything from it, but out of nowhere a new trailer is here and man, it's a stunner. 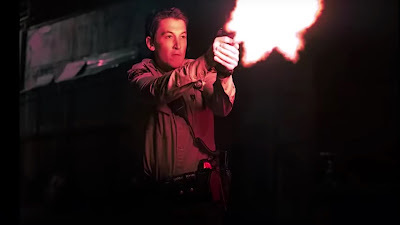 Refn's flair for dramatic visuals energizes the violent and poetic trailer, which features Miles Teller as an anguished Los Angeles cop who, following the accidental shooting of a woman, descends into a criminal underworld of working-class assassins, yakuza, Russian mobsters, Mexican cartels, and teenage killers. Refn has surrounded Teller with an extraordinary cast that includes Jena Malone, Billy Baldwin, John Hawkes, Nell Tiger Free, Babs Olusanmokun, Callie Hernandez, and Cristina Rodlo. He directed all 10 episodes and co-wrote the script with crime novelist and comic book veteran Ed Brubaker. Amazon will debut Too Old to Die Young on June 14th.